Growing links with China have supported economic growth in sub-Saharan Africa. But the burgeoning commercial and financial ties between the developing subcontinent and the world’s second-biggest economy carry risks as well. These links also expose sub-Saharan African countries to potentially negative spillovers from China if the Asian giant’s growth slows or the composition of its demand changes. The old aphorism “If America sneezes, the world catches a cold” referred to the U.S. economy’s role as a locomotive for the global economy, but it can now apply to any symbiotic relationship between a dominant economy and its clients. China has become a major development partner of sub-Saharan Africa. It is now the subcontinent’s largest single trading partner and a key investor and provider of aid. China’s increasing role in sub-Saharan Africa reflects China’s increasing share as a major player in world trade and its historic reorientation, started during the last decade and more, toward new markets including Africa. The natural-resource intensity in China’s economic growth and sub-Saharan Africa’s natural resource abundance have further strengthened the relationship. We have assembled data that measure how changes in Chinese investment affected exports from Africa over the last decade and a half. These data show that sub-Saharan Africa’s resource-rich economies, in particular, are subject to spillover from China: natural resource exports from Africa quickly reflect trends in Asia’s dominant economy. Overall, sub-Saharan Africa has maintained a slight trade deficit with China, with fewer than half of the African countries having a trade surplus with China. In addition, China’s trade with sub-Saharan Africa is highly concentrated in a few economies. Five countries—Angola, South Africa, the Democratic Republic of the Congo, the Republic of Congo, and Equatorial Guinea—account for about 75 percent of the subcontinent’s exports to China. 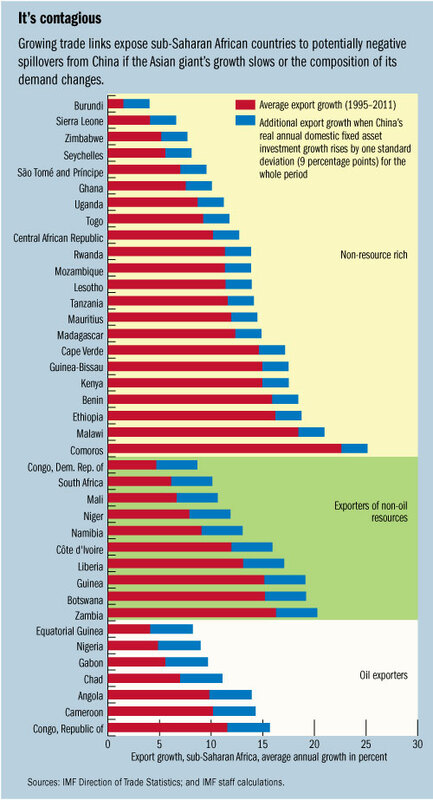 Also, Africa’s exports to China are heavily concentrated in primary products, mainly oil. By 2008 (before the short-lived collapse in oil prices in 2009), mineral fuel and related materials accounted for about 45 percent of all sub-Saharan African exports to China, and for more than 84 percent of exports if we exclude South African exports. We use panel data to analyze the way in which China’s domestic investment has affected sub-Saharan Africa’s export growth during the past 15 years. We find that a 1 percentage point change in China’s real domestic fixed asset investment growth would alter sub-Saharan Africa’s export growth rate on average by 0.6 percentage point, but the intensity varies by country group. Look at the chart. On top of average export growth for each country between 1995 and 2011 (the red bars) we have added the additional export growth (the blue bars) triggered by a defined boost in Chinese investment. And we have split the countries into groups according to their natural resources: on top, those that have few resources; in the middle, those that have resources other than oil; and on the bottom those that export oil. The differences are uniform and plain to see. Changes in Chinese investment do a little for the resource-thin top group, appreciably more for the non-oil resource middle group, and a lot more for the oil exporters. These results directly correlate with the primary product–intensity of China’s trade with Africa. The China effect is larger for resource-rich countries in sub-Saharan Africa, especially oil exporters, because they account for a large share of the region’s exports to China. Part of the effect is indirect, working through the impact of Chinese investment on global growth and commodity prices. But direct trading links are also important. For the top five resource-rich sub-Saharan African countries ranked by exports to China as a share of GDP—Angola, South Africa, the Republic of Congo, Equatorial Guinea, the Democratic Republic of the Congo—a 1 percentage point change in China’s domestic investment growth would be accompanied by a 0.8 percentage point change in their export growth rate. Thus the chart also shows which African countries will have the biggest spillover effects from any change in China’s economic performance—and where in Africa the need for a stiff course of antibiotics will be greatest if Asia’s biggest economy catches a chill.